Looking to buy Overlay Pattern Stencils by Increte Systems in Rochester NY, Ithaca NY and Western New York? With an A+ reputation for customer service and prompt pick-up and delivery, the Duke Company proudly carries the full line of Increte Stamped Concrete System products. 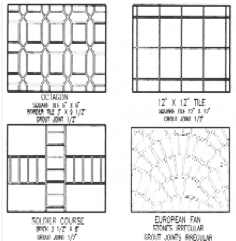 The Duke Company proudly carries the extensive line of overlay pattern stencils by Increte Systems. Highly engineered, pecifically for Spray-Deck and Texture-Crete. Very durable polypropylene plastic that is easy to clean.